In the People’s Spring Struggle, we organize national and local actions toward the large corporations and the employers’ organizations. Unions will use the right to strike in the concerted struggle to win the demands from the workplaces in labor talks and spread the gains to workers throughout the country. Unions also fight to realize the people’s demands as lawmakers discuss the national budget and other important bills in the current Ordinary Session of the Diet. In our recent campaigns, Zenroren and the Joint Committee of the People’s Spring Struggle have combined the demands arising from the workplaces and the people’s common demands. In defiance of harsh corporate attacks, the unions have won certain results by pushing back the government or corporate aims. However, the workers’ wages have been declining since they peaked in 1996. Many workers are forced into long working hours through overtime work without pay, or due to an increase in nominal managerial positions. There are workers who are physically or mentally damaged by workplace harassment. The number of low-paid contingent workers is on the rise. The large corporations have amassed more than 425 trillion yen in internal reserves. Five thousand companies capitalized at more than 1 billion yen - excluding finance and insurance businesses - have accumulated 347 trillion yen in internal reserves. The amount of internal reserves held by finance and insurance companies has reached 78 trillion yen. The total amount of internal reserves has increased by 30 percent since Prime Minister Abe’s second cabinet started. The number of taxpayers whose yearly income is more than 100 million yen stands at 20,521. Although they account for just 0.01 percent of the total taxpayers, they earn more than 5 trillion yen, or 12.8 percent of the total. Despite the hardships and economic inequalities facing the workers, Prime Minister Abe tries to ward off the workers’ pressing demand for a substantial wage increase by requesting the business leaders to give a 3 percent pay raise. The government has eased working time regulations. It has adversely revised one labor law after another, only to increase karoshi (death from overwork) and suicide from overwork. In dealing with the problem of contingent workers, there is a lot of talk about the need to give them equal treatment, but the government does nothing to eliminate the inequality in the workplace. In addition, it is proposing diverse ways of working for all workers and people in general and is calling on people to become “active workers for life,” denying employment relationship. Ultimately, it is urging workers to take responsibility for themselves and to compete with each other. Prime Minister Abe is intent on proposing a draft of a revised Constitution focusing on Article 9. He is proposing using tax money to purchase military equipment enabling the country to make military attack abroad, substantially changing the meaning of Japan’s “self-defense”, and is also raising the total amount of the national defense budget. What is more, the consumption tax rate is expected to increase to 10 percent (from the present 8 percent) in October. Under the name of “social security supported by all generations,” the government plans cutbacks in social services, including pensions, health care, and nursing care. The 2019 People’s Spring Struggle, which should be worthy of the 30th anniversary of the Joint Committee of the People’s Spring Struggle, will pay greater attention to union members’ struggle and promote struggles in the workplace against the employer in tandem with struggles in local communities. Utilizing a survey on workers in the Spring Struggle and workplace conversations, we will collect as many demands as possible and stage united struggles of Zenroren and federations, and regional actions, based on unity in the workplace. Concerted strikes will be used as the axis around which union members will unite themselves to fight tenaciously to achieve the demands. The results of these struggles will be spread nationwide. We will stage a struggle to win a wage increase with the backing of public opinion and help raise the awareness that raising wages is essential for a virtuous cycle in the economy and that a sharp wage increase is possible for all workers. We particularly put emphasis on the struggle to raise the minimum wage, in which full-time regular workers and contingent workers alike in the workplace should take the issue as their own. And we combine the demand for wage increase and the struggle to raise the minimum wage in the workplace struggles so that all workers can receive a pay raise and that real wage increase is achieved. 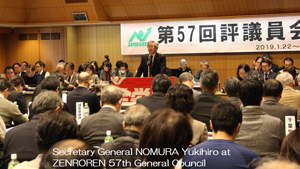 We also call on union members to confirm that people can work with human dignity only by stopping Prime Minister Abe’s quest for turning Japan into a country that wages war and by defending a peaceful society. We will make efforts to broaden union members’ participation in the joint struggle in defense of the Constitution focusing on opposition to the adverse amendment of Article 9. We will also increase the struggle to stop the consumption tax increase and improve social services and working conditions for welfare service workers. We will hold fast to the demands. Basing our activity in the workplace, we will encourage every union member to participate in central or regional action from federations/unions. We will provide feedback about gains from participation in actions with a view to energizing workplace activities and organizing efforts. We will strike back attacks in waves from the government and the business sector. We will fight to open a bright future in which 8-hour workday will enable everyone to make ends meet. With the establishment of industrial and regional policies in mind, we will help raise public awareness in the workplace and communities. Let us step up the movement from the workplace with the upcoming nationwide local elections in April and the House of Councilors election in summer in mind.